The three towns that you can reach from the Crossroads outside your farm each have their own shops that you can purchase goods from to benefit your farm. 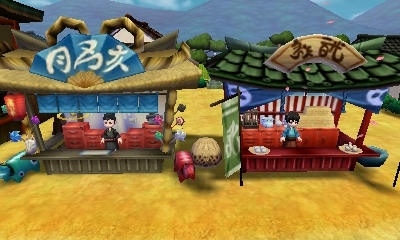 Since each of the three towns has its own culture compared to the others, you'll also find differnet types of items for sale: western-themed items in Westown, eastern-themed items in Tsuyukusa, and tropical-themed items in Lulukoko. Each town has its shops opening and closing at different hours, so you could go shopping in one town while waiting for the shops to open in the other town. Generally, Westown's shops are open at 10:00, Tsuyukusa's shops are open at 8:00, and Lulukoko's shops are open at 6:00. Because of the warm temperatures in Lulukoko, the shops along the beach are closed at 10:00 but they open again at 17:00. All of the shops are open on rainy days, but will be closed on stormy weather days (with the exception of Ford's health clinic in Westown). The shops are also closed on days that the shopkeepers might be participating in a gathering such as the Harvest Festival, the Beverage Bash, Star Festival, and so on. They won't be closed on casual festivals such as Valentine's Day, Pumpkin Jamboree, etc. To access a shopkeeper's inventory, simply walk up to the store counter and press the A Button on your Nintendo 3DS. There are two shops that are a little trickier though; the Clinic in Westown and the Carosello seaside cafe in Lulukoko. For these two shops, keep an eye on the prompt at the bottom of the screen. If you aren't standing at the right location, you will trigger a conversation with Ford or Iluka instead of accessing their shop inventory. Just move around a little bit until you see the proper prompt before pressing the A Button. When you unlock new items at the shops, you will receive a letter in your mailbox announcing the shop has new items. To find out what is actually new, you have to go to the shop and look for the NEW icon next to the item in the inventory list. The NEW indicator will disappear after you leave the inventory screen. 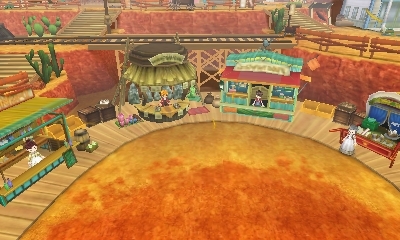 The western-themed shops are all located in North Westown; there are no stores in South Westown. All of the buildings here are a shop of some sort. 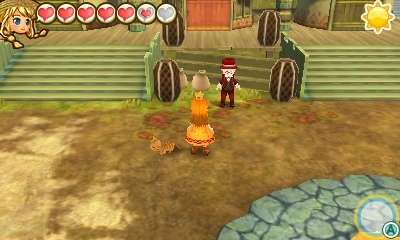 The shops on the base level are run by non-important characters, while the shops on the second and third tiers of the town are run by villagers, with the shop area in the front-half of their houses and the living quarters either behind or upstairs. Similar to Westown, the stores in Tsuyukusa are all located in the northern area of the village. There are a few outdoor stalls and four merchants located inside the large wholesale store in the middle of town, called Ra Man's. 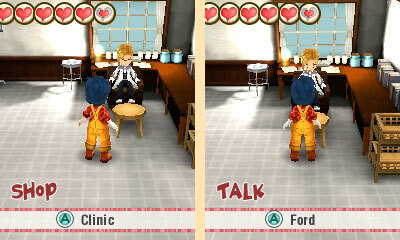 Tsuyukusa also has a bath house that you'll restore as you make your way through the Town Link Ranks for this town. 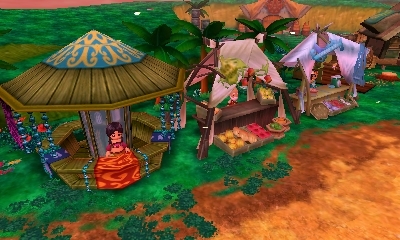 The two areas of Lulukoko both contain shops, with most of the South Lulukoko shops closed mid-day for a siesta and the shops in North Lulukoko open for the entire day without a break. You can go fishing along the beach while you wait for the shops to open for the evening, but the shop-opening scene will be delayed if you happen to be waiting for a bite when 17:00 rolls around; sometimes the cut scene doesn't play at all if you're fishing, but the shops will be open after you reel in your fishing line. The red-suited picture show man appears in a specific town three times each week, from about 12:00 until 16:00. On Tuesdays he will be in North Westown by the windmill in the south-east corner, on Wednesdays he is by Inari's shrine in North Tsuyukusa, and on Thursdays he is in front of the Lala Salama Inn in North Lulukoko. The performer won't appear on festival days. On the days the performer appears, you can pay him 50 G to watch one episode of a picture show. After you watch all the episodes of a particular show, the next one will unlock. There are three sequential picture shows, with a fourth appearing if you buy the optional DLC for the game. Looking for a Star (8 episodes) - A little kitty kid named Noah goes out in search for a very special star. Magical Warriors: Idol Rune (11 episodes) - Two rival singing groups, Idol Rune and Black Star, compete to be the most popular idol group. Riverside Story (8 episodes) - Two school friends make a promise to meet again in the future. After you see that day's selected picture show, the performer will reward you with a snack. The snack you'll receive will be random based on the location of where the performer is currenty located.